I was initially surprised to learn that FX had developed a show about KGB sleeper agents, more so when I learned it is something of a hit. In retrospect I should not have been so surprised; the anti-hero had become such a staple of "long form television" that KGB agents are no more surprising subjects for a show than mobsters, bootleggers, advertising executives, serial killers, and drug kingpins. KGB agents could be considered to be yet another variant of the popular sociopath. Thus, a show about KGB agents does not suggest some kind of immediate revision of cold war history and propaganda, but it does revisit a period of recent history. 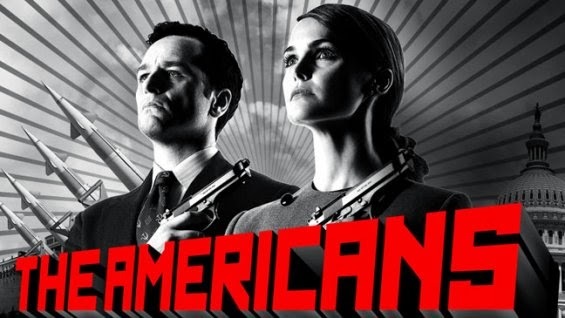 The basic story of The Americans centers on two KGB sleeper agents (Elizabeth and Philip Jennings, played by Kerri Russell and Matthew Rhys) in suburban Virginia outside DC. By day they are a married couple with kids, but by night they spy on the US government. However, if one wanted to place The Americans within the spectrum of various televisions shows that have come before it, shows that have inevitably been examined for the secrets of their success and copied, its format situates it somewhere between Breaking Bad and Mad Men. From the former it borrows not only a high strung premise, in which the possibility of secrets being discovered hovers over every episode, but a focus on a mediated version of domestic conflict. The standard dramas of separation and divorce are presented, but there causes are less the standard stuff of infidelity and boredom than the tensions of leading a double life. It borrows the latter's attention to period detail and interplay of familiar and unfamiliar, as known historic events punctuate the narrative thread. Just as Mad Men offered a return to the sixties for baby boomers, a chance to remember where they were when JFK was shot, The Americans offers a return to the eighties for generation X. The eighties of The Americans is not the neon and pop infused one that we have come to know through its multiple repetitions in 80s dance nights and John Hughes nostalgia. It is something darker and more filled with dread, more The Day After than Ferris Bueller's Day Off. The perspective of KGB agents within the US skews the entire decade, constructing a narrative and a history that is at odds with nostalgia and even memory. The tension between memory and history comes to light most strongest in the assassination attempt of Ronald Reagan. Memory (and or trivia) presents this event to us as yet another oddly apolitical political event, an attempted assassination fueled more by madness and pop culture than power and ideology. In the show, however, this event is seen through the refracted lens of KGB agents and FBI counter intelligence agents who all believe, in the hectic crazy moments of that March afternoon, that the shots fired in DC might be the first salvo in a more open cold war. From the perspective of the KGB agents Secretary of State Alexander Haig's claim to "be in control" appears less as a momentary declaration awaiting the return of the vice president than the declaration of military coup. As something of an aside I should mention that I was ten years old when Reagan was shot. I did not know much about politics then, but I did not know that my father was not a fan of Reagan. I remember calling him from the house of whatever neighbor was taking care of my brother and me after school that afternoon to inform him of the good news. He latter explained the difference between beating one's political enemies in an election versus assassination, attempting to quell my young Machiavellian tendencies. He might have preferred ballots to bullets, but three years later, on a family trip to see the sights and history of our nation's capitol, he booked us rooms at the Washington Hilton Hotel. In the case of the Reagan assassination narrative works against established history, reframing an idiosyncratic act of mass media induced madness in the context of global political conflict. The overall narrative of the first season almost works in the opposite direction. The central objective of the spies in the first season is to uncover the "star wars" defense. Throughout the season this technology is presented as something that will throw the balance of "mutually assured destruction" hopelessly out of whack, placing the soviets at a huge disadvantage. It is only in the last episode that the KGB agents come to know what we know now, that "star wars" never could work. The US colonel spying for the KGB states that the entire project is either a product of Reagan's delusion or a massive bluff. In the first instance, that of Reagan's assassination, the show places the brutal logic of realpolitik under what is remembered as a trivia question about an obsession with Jodie Foster, replacing fantasy with power; while in the second, that of "star wars" it reminds us how much power is itself a fantasy, and hinges on the creation and maintenance of fantasy. To the extent that the show has any political aspect it is in this refraction of standard narratives and nostalgic memories of the time. Aside from one line where Elizabeth (Kerri Russell) states that she hopes her children, children born and raised in the US as Americans, will grow up to be "trade unionists" or "socialists," there is little ideological conflict in the show. The conflict of the cold war is generally presented as a conflict between two nations, between the US and Russia understood as "the motherland," rather than two ideologies or economic systems. This might be accurate for all I know, KGB agents in 80s probably did not discuss ownership of the means of production or the "withering away of the state." I do not really know, I have never been up on my soviet history. I have always been a bad Marxist in that respect.There are exceptions to this nationalization of the conflict, as in the line above and in the character of Gregory, a civil rights activist who is recruited to work for the KGB. One can hope that these aspects will develop in the current season. It is impossible not to read The Americans against the transformations of technology that have opened up the world to new possibilities of spying and surveillance. In a time when every web search, phone call, and email is immediately stored, recorded and monitored, the painstaking work of the show's surveillance, actually planting bugs and retrieving tapes, seems almost quaint. Perhaps this is why the KGB can now become something like heroes, or at least anti-heroes. Compared to today's NSA the KGB seems a lot less frightening. That is not much of a conclusion, I know, but I will have the Talking Heads play us out in what should be the show's theme song.